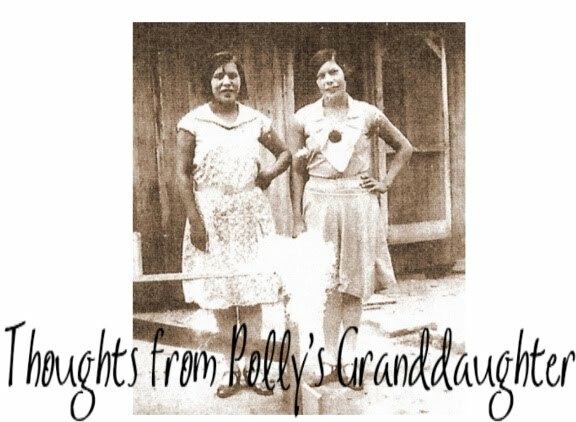 A Warren supporter has been leaving unpublished comments on the blogs because they think they have found proof that Warren's ancestors were Indians and that my team and I don't know what we are doing. Well, they are wrong. They are the ones that don't know what they are talking about. I figured it was time to set them straight. Here is one of their comments. 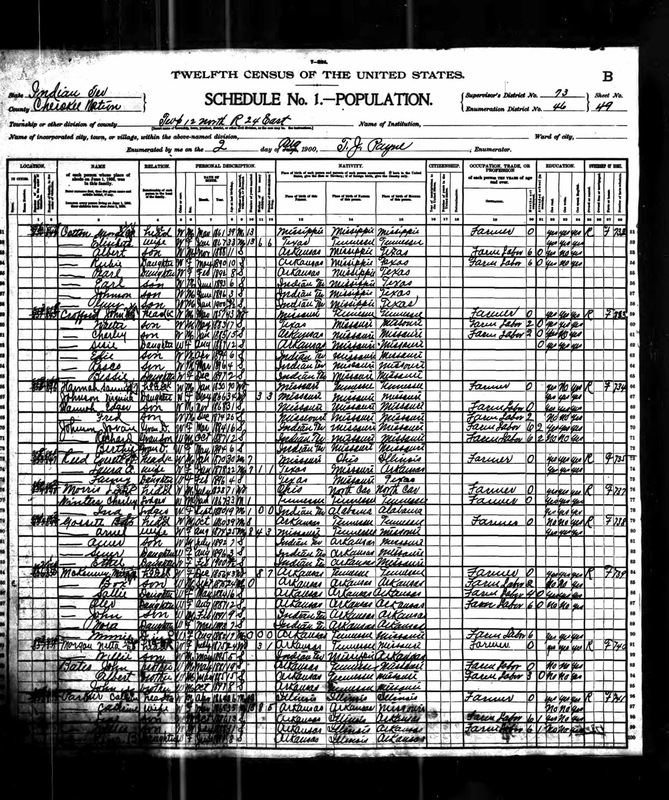 "So interesting that in the 1900 Census ALL the residents of Indian Territory, Cherokee Nation, Township 12, District 47 are listed as white. That's a lot of non-Cherokees living in Cherokee Nation. Why would that be, I wonder? Oh, and you will find that on Warren's grandmother's marriage certificate, the bride's residence is listed as "Indian Territory." I'm sure that is some sort of silly mistake in the records, too, is it not? No doubt she was just on vacation in Indian Territory. her sister, too, has a marriage certificate, and her sister's residence was also listed as "Indian Territory." Hm? Pesky facts, eh?" 1 - So interesting that in the 1900 Census ALL the residents of Indian Territory, Cherokee Nation, Township 12, District 47 are listed as white. Wrong. 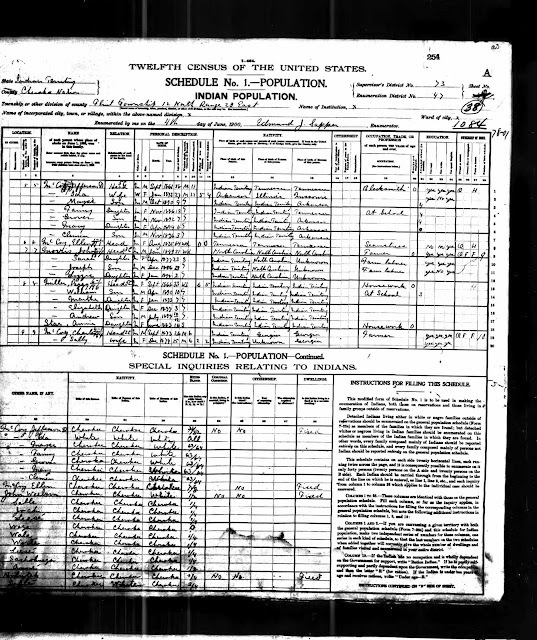 Below is just one of the many census pages of Indians living in Indian Territory, Cherokee Nation, Township 12, District 47. 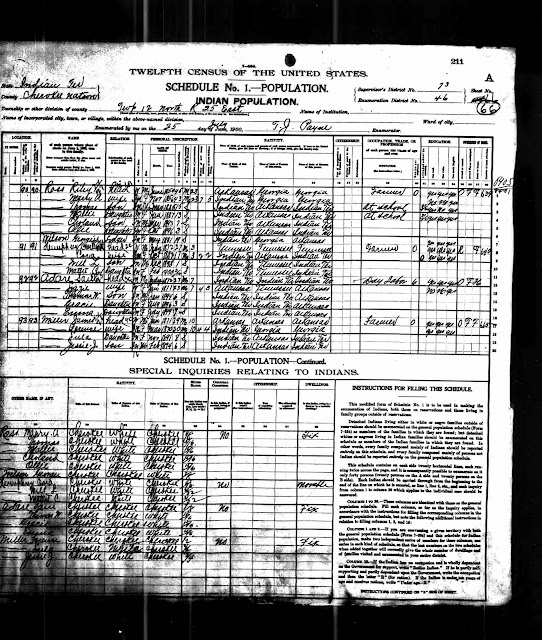 Apparently you didn't realize there were two different forms used on the 1900 Census. One was for non-Indians; the other for Indians and the non-Indians who had married into their families. Notice at the top of the schedule it says, "Indian Population." And John H. Crawford and his daughter, Laura, who married Everett Reed, were found on the census in District 46 (not 47) listed on the non-Indian schedule form because they were WHITE. And yes, there were Indians living in that district too. See below. 2 - That's a lot of non-Cherokees living in Cherokee Nation. Why would that be, I wonder? Oh, and you will find that on Warren's grandmother's marriage certificate, the bride's residence is listed as "Indian Territory." I'm sure that is some sort of silly mistake in the records, too, is it not? No doubt she was just on vacation in Indian Territory. 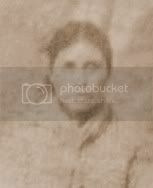 her sister, too, has a marriage certificate, and her sister's residence was also listed as "Indian Territory." Hm? "To anyone familiar with the laws of the five civilized tribes of Indian Territory, there is no mystery to it! Those tribes were sovereign Indian NATIONS, with their own constitutions, laws, and governments. The 130,000+ NON-Indians who had inundated Indian Territory after the Civil War were looking for free Indian homesteads and land-- the same as their ancestors had received when the Indians were removed from our eastern lands. They were called "Illegal Intruders" (several books written on the subject). Since they were non-Indians and illegally squatting on the sovereign land of the Indians, what were these squatters suppose to do when they wanted to get married legally? Since they were not tribal members, the Tribe were certainly not going to issue a tribal license and maintain a marriage register for them, and in some cases, they didn't want the tribe to even know they were living on their land. So-- they had to either go to one of the three Federal Courthouses (McAlester, Muskogee or Vinita), obtain a license and return it to have it legally registered there, or go across the state line into the nearest town that wasn't in Indian Territory-"
...in Hannie Crawford's case, Sebastian County, Arkansas. And if you would have read all the information I had posted about Warren's ancestors before you jumped to conclusions, you would have seen this post and realized I had already explained the Hannie Crawford - Harry Reed marriage. 3 - Pesky facts, eh? No, just facts. The only thing that is pesky are Warren and her supporters who keep trying to twist facts into fiction and turn her white ancestors into Indians. pesky things- facts- they keep getting in the way of the warren narrative. the lack of regard for honesty,fairness, and facts in this whole sordid affair (of ms. warren's own construction) leaves me dumbfounded and appalled. continuing steadfast and with logic and documentation in countering this example of fraud is quite an undertaking. thank you for your persistance in the face of the abuse aimed at you. the truth is important- more important than one woman's personal political ambitions. fewer and fewer people seem willing to stand up for truthfulness and honesty- what used to be considered components of good 'character' if not a moral obligation of those who are law abiding and respecters of other persons. someone- who pointedly refuses to acknowledge all the documentation tribes require for membership- could take a DNA swab and end this all at once- but somehow i don't think that will ever happen. of course someone could also have paid each year to keep a valid law license in ma but that never happened either. gee- does that look like a pattern of behavior? just like treaties and obligations to numerous Indian tribes were ignored, violated and shredded so some still think they are above the laws and regulations the rest of us are obliged to follow . does anyone really think we should be putting forth people for office who feel they are above the laws? clearly those attacking you and your work feel we should. or else. Hi, I've been following your blog for several months and each post provides a tidbit of information for my own research. I would be interested in some of those books you mentioned that discuss the illegal intruders. Can you give me some titles/authors? I've wondered many times why my Irish/Scot g-grandfather settled in Indian Territory and married my part Cherokee g-grandmother. A very good one to understand the issue of the intruders.